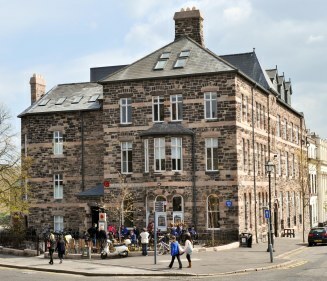 Following five days of collaboration between community representatives, statutory agencies, and the FAB summer school everyone gathered at the Crescent Arts Centre on Friday 19 August for a presentation of the summer school’s findings. To explain the concept Mark Hackett (Architect and FAB Co Director) explained how streets in a city help to create blocks and enrich the urban fabric, whilst roads such as Dunbar Link and the Westlink often disrupt the urban fabric and serve a one dimensional function – to aid traffic flow. The land reserved for the southern section of the inner city ring road. A focus on roads and vehicle priority in the city is misguided, claims Mark, as most people living within the city do not have access to a car. Mark shows a map of car ownership in Belfast which highlights the low car ownership levels around the inner city. Explaining the current situation Mark suggests that it is the commuters from outlying areas that create the traffic within the city - travelling into the city in the morning and leaving at night – but it is the communities within the city that put up with the traffic dominance and congestion. Is this right? The community of south Belfast have has the threat of the southern section of the inner ring looming over them for 30 years due to large volumes of ‘one person private cars’ from the suburbs or outlying towns. Is this right? Ormeau Avenue and Bankmore Street. Mark suggests that this is not right and that a different attitude is required to roads in the city. There is no real driver behind Bankmore Link yet there is the potential for another devastating roads scheme through Belfast. Mark claims that in 40 years Belfast has not built a successful street. A strong claim to make but it seems he is right. What other city in Europe could let 40 years of urban development pass without a successful new street forming? A focus of successful urban settlements is the block structure, as seen in Barcelona and New York, but in Belfast we seem to have forgotten this important planning technique. Mark suggests that streets are key to rebuilding city blocks and creating a liveable city. Streets of a good scale with all day activity and catering for multiple transport modes are successful and beneficial, not just to the residents and businesses on the street, but to the city as a whole. Mark suggests that the Gasworks should be reworked to better integrate the area with south Belfast with on street parking and new buildings designed to create blocks – These steps will help to establish a street network through an inner city area as opposed to a road network through an ‘island’ business park. be further enhanced with a new bridge across the Lagan to Ormeau Park. Illustrations showing roads such as Bruce Street, Hope Street and Ormeau Avenue as streets with buildings along the pavement and active frontages together with spaces for cars, people and bicycles suggest how we can transform bleak, derelict roads into attractive inner city spaces. Commenting on the presentation by Mark, Roads Service representative Steven Pollock claimed that these were exciting times and he welcomed the change of terminology as the potential beginning of a new era of transport planning in the city. However he reminded everyone that whilst streets are more attractive for people, they also have a function for vehicles, and many people in Northern Ireland still wish to use their car. The acceptance by Roads Service that a successful city designs ‘streets’ not ‘roads’ is a huge success for the summer school but it would not be possible without the combined efforts of everyone working together throughout the week sharing ideas and skills. for a change of policy in Northern Ireland and an adoption of Manual for Streets? To achieve the main outcome of the 2011 summer school - “Streets not roads” – required collaboration. Day one of the summer school was hugely significant as it brought all the statutory bodies together to present their latest thinking on the study area of south Belfast. The support from the various agencies shows a commitment to collaboration and working towards a successful future for Belfast. Of course the collaborative effort wasn’t confined to Monday – Throughout the week long summer school over 30 participants from students to professionals in various disciplines came together to create what Declan Hill describes as a “multi dimensional solution”. Ken Sterrett – an advocate of collaborative working – described the summer school as an excellent example of collaborative working and thinking between departments and disciplines and suggested that this is the way forward to deliver a better quality of city planning and development. Ken congratulated everyone for delivering a quality “framework for a solution”. FAB’s special guest for the week -Senada Demirovic Habibija (Senior Advisor for Urban Planning, City of Mostar, Boznia and Herzegovina) - echoed the sentiments of Ken, calling the process “the way forward” to create the “new, exciting Belfast of the future”. Read about Senada's presentation on Mostar in Part 4 of 4: Lessons from Mostar. To achieve the vision of “streets not roads” there must first be some reduction in traffic admits Mark. However a significant policy decision must be taken to reverse the current thinking within DRD that traffic volumes will continue to increase. If all plans are developed with this outlook then traffic will increase claims Mark – But if policy accepts that traffic levels must be brought down in the city then we can start to plan for a more successful city. The Ormeau Avenue – Bankmore Street area has been blighted for years due to thinking ahead for an increase in traffic – Mark states that bad policy created the wasteland around inner south Belfast and good policy is required to connect and repair it. How the BRT vehicle may look... From www.drdni.gov.uk. Mark and Declan both suggest that the Belfast Rapid Transit system (BRT) will help to reduce traffic when implemented and that in conjunction with the introduction of the BRT a series of benchmarks should be set to gradually reduce city centre traffic levels. As part of the summer school a series of video clips captured traffic flow behind City Hall from morning, through noon and rush hour to the evening. The findings illustrated that traffic flow is almost constant even into the evening. 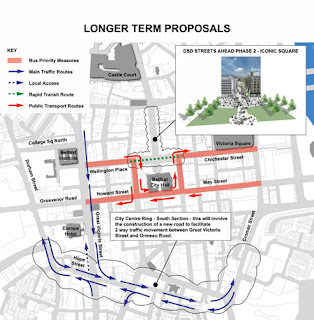 The proposed public realm works at Donegall Square will mean a change from 100% to 0% overnight highlights Declan – but with a gradual drop in traffic levels through a series of benchmark targets we can sustainably manage city centre traffic. Mark asks if we should have a sterile environment at City Hall with no activity after 6pm to the detriment of inner south Belfast or is the Bankmore Link really necessary if we can reduce traffic to a level that city ‘streets’ can handle traffic flow without the need for another barrier to the city centre (i.e. Bankmore Link). Square North and divert traffic flow to inner south Belfast. Steven Pollock from Roads Service stated that a directive from the Minister is required to implement this policy at a higher statutory level and then from this the vision of city streets will fall into place. A representative from Friends of the Earth in attendance questioned why the Minister and Department for Regional Development couldn’t work for a wider reduction in traffic quicker. Most of those in attendance accepted that this would not be likely without full agreement and that any radical and sudden change would not be well accepted by the majority of the public who have grown used to a car dependant society. It was generally agreed that a slow and incremental approach would be required to allow people to adjust to a new transport culture. Glen Robertson from the Northern Ireland Independent Retail Trade Association then entered the debate by highlighting that Ormeau Road and Lisburn Road in south Belfast are important arterial routes and that the passing trade is vital to businesses along these routes. Whilst he welcomed the proposals he urged caution when adopting traffic reduction policies in the city centre. Declan reminded everyone that “quality places are good for business” and that successful streets provide businesses with more customers in the form of inner city residents and for residents there is a greater choice of services within walking distance. Arising from the summer school are various key opportunity sites which present an opportunity to design quality buildings that contribute to the street environment rather than detract from it. active frontage onto Wellwood Street. 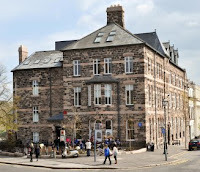 As stated by Ken, some of the main visions of FAB are, to connect and repair Belfast’s empty land and derelict buildings, repopulate and create a liveable city with quality places to live and recognise the connection between the physical and social environment. There are no longer just the traditional territories in Belfast but new areas are forming which could potentially create new social divides amongst classes, e.g. Titanic Quarter and Sirocco Quays. Responding to a question from Belfast Healthy Cities Ken explained that any new development in the study area should provide housing for a range of family sizes and for various tenures. The new streets should be “animated with the right services for a new population and the existing population". A series of visuals provided everyone with an idea of how the area could look and the potential opportunities to develop city streets on roads that currently present a bleak wilderness. were also highlighted by FAB.